At Mayor's Question time on the 17th of January, London Mayor Sadiq Khan told GLA Councillor David Kurten that taxis produce 20% of NOx in Central London today and will produce 30% of NOx by 2020....When questioned about the validity of the statistics he said why should I ignore the science from my experts !!! But in a written answer to Cllr Kurten, Mayor Khan has now admitted the statistics are no more than ESTIMATES - i.e. figures not based on any measurements, but plucked out of thin air. But these guesstimated statistics are now flying around the media as pure facts and being used to damage the London Taxi trade. Taxi Leaks asks: Why have our largest org, the one who allegedly have secret meetings with the mayor and TfL commissioner Mike Brown not said anything about these lies ??? Why have none of our smaller orgs or three Unions said anything about these lies ??? Every Taxi follows TfL mandated guidelines over emissions, each vehicle having two MOTs and a TFL inspection every year. The Mayor is using zombie statistic to push through a third party agenda that fits his future Transport Strategy for London. This could spell the 'end as we know it' for our 365 year old tradition of plying for hire on the streets of the capital. As outlined in the answer to Mayor's Question 2019/0219, the relative contribution to total road transport emissions of each vehicle type is 'estimated' using information on the composition of the vehicle fleet, the annual distances covered, emissions factors for that class of vehicle and information on the road links on the London network. The results of this work are published in the outputs from the London Atmospheric Emissions Inventory. The contribution to total NOx emissions from taxis in Central London by 2020 is 'estimated' at around 30 per cent, making them the largest single contributor to NOx concentrations in that area. 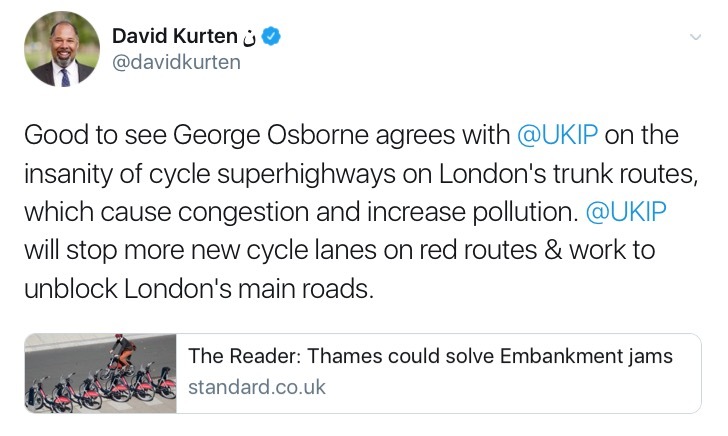 How is the Mayor being allowed by our orgs and unions to get away with these lies which could damage our future, considering he has offered no scientific proof??? 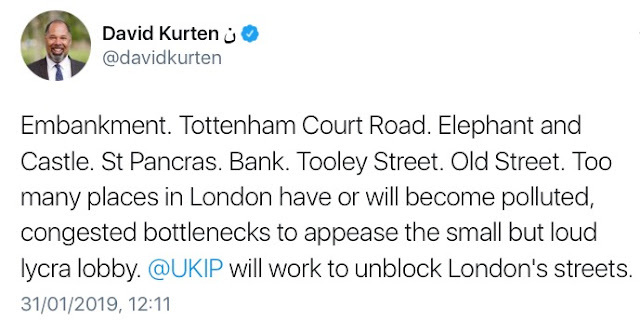 It seems that the Cllr for the Brexit Alliance Group, David Kurten, has shown more support for the London Taxi trade than some of the people who purport to represent the trade. Davis even took the time to come over to Tottenham Court Road, to shoe support for the drivers fighting to protect their right of access on London's roads. 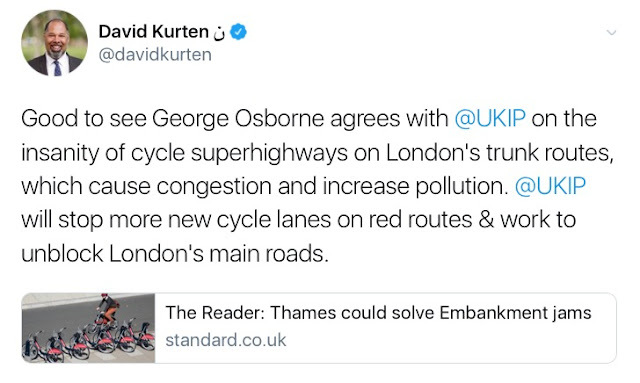 David has also not been slow in giving his opinion on what is actually causing the congestion and pollution in central London !!! 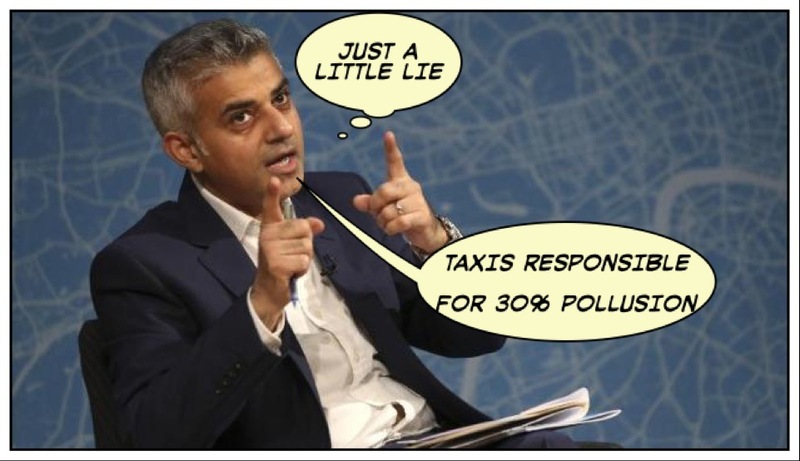 Shown his self up to be the fool he really is how can nox emissions go up from taxis in 2020 when the TXE has been the only cab available since 2018, with diesels coming off due to age limit simple fact is it will decrease, unless everyone with a tx2/4 works 24hours a day. Mind you I know a few guys who do nearly those hours!